This space has been quiet for a long time. The longer there is silence, the more difficult it is to re-emerge into the daylight. Silence is not usually golden here, and the past months have been enormously challenging. We live in a troubled world and one of uncertainty. This has affected me directly and my work in Africa came to an unexpected and early end. I will not pretend I was ready to wrap up nearly two decades of life and work overseas, but that is life. To complicate and intensify an already difficult situation, I was also tussling with scary health issues. Happily, it is not all bad news and it appears that this has NOT been cancer related. I am in much better shape than I was in the earlier months of the year, but still striving to fully regain health and have greater clarity and management of the situation I now find myself in. So I find myself in a very strange space and with very little remaining of the life I was so used to. I am in totally new waters, and I feel poorly equipped to move forward or even to know in which direction forward lies. I will be honest. I usually thrive on change and new challenges. This time however, the changes have affected all areas of life, and been painfully deep. I crave stability and find that there is little to grasp onto, to enable me to clamber onto solid ground and work out my direction ahead. I know I will work it out, but I have had to dig deeper than ever before into reserves which feel exhausted. While there are major life decisions to make, there are also implications on the essence of this blog. I am no longer a Scottish woman overseas. I am a Scottish woman in Scotland, cherishing and reflecting on the best part of two decades of life and work overseas. And still dealing with the aftermath and sides of breast cancer. Constants amidst the change. I am floundering somewhat as I try to get used to life back in a Scotland which is enormously different to the one I left with a suitcase and rucksack, bound for Kathmandu 17 years ago. I guess I am now a “repat” and no longer an “expat”. I have a great deal to learn, re-learn and become familiar with. Such as Scottish wild flowers, covering the hedgerows and gardens where I have become used to frangipani, hibiscus and bougainvillea. Such as very different bird and critter noises. Seagulls instead of geckos and frogs. Such as, bewildering choices in the cavernous supermarkets. Exhilarating options for cultural and creative engagement. Understanding the words, but not not the essence of conversations on the train and in the street. Such different perspectives in the news and media. So many directions to look towards. While I am firmly physically re-grounded in Scotland, my heart and soul are feeling scattered. I still have many tales to tell from my overseas times. One of my words for the year has been explore. While circumstances have not been conducive to great exploring, there have nonetheless been a number of gentle adventures and experiences. I plan to tell those stories and share the images in the coming weeks and months. Tales of Rwandan weddings, African sunsets and safaris, lakeside resting, and exotic Zanzibar to highlight but a few. Telling these tales will support a gecko which is striving to swim, and not sink, in these new waters. The season is shifting. The daytime warmth is now an uncomfortable, sticky heat and we start to yearn for the rains. The cool mornings have started to warm a little, but not as much as the seasonal usual. And not enough to nurture the budding mangoes. I fear a poor mango season is ahead. On my way to work the other morning, I stopped near the traffic lights as usual to buy strings of threaded jasmine blossom. The regular seller handed me my strings, and as I moved forward I lifted them to my face without thinking, breathing in the sweet scent. He ran back towards me, proffering a small blossom of the newly flowering tree, known as the university blossoms, the Myanmar word sounding to me like “gangkaw”. “It smells good” he told me in Myanmar, and gave me the stem to take with me before disappearing into the traffic again to sell his flowers. These moments warm my soul, and brighten my outlook. Especially when my personal outlook is clouded by the next rounds of scans and checks, which will be upon me before the month is out. I try and put these thoughts to the side, hiding them in the heady, heavy sweetness of the flowers watching over me. The sight of the flower on my desk throughout the day brought many remarks and smiles. I learned that there are many of these blossoms on trees flowering at the university. 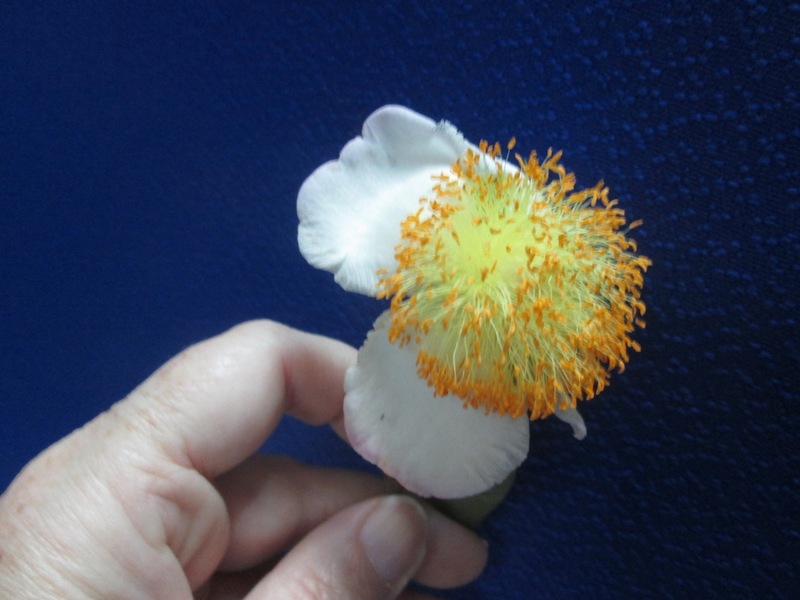 The flower is associated with students, learning, summer, graduation and the forthcoming Thingyan Water Festival. As the season shifts, there are signs all around. The first glimpses of jacaranda, plastic padauk flowers for sale and the proliferation of the Gangkaw flowers with their sweet, heavy scent. It is hard to imagine that on this day a year ago, I arrived in Scotland and was greeted by perishing temperatures and snow. But as the season shifts here, those signs are visible across the globe too. The stretching of the daylight hours in Scotland, and the appearance of snowdrops, crocuses and daffodils all heralding the coming spring. 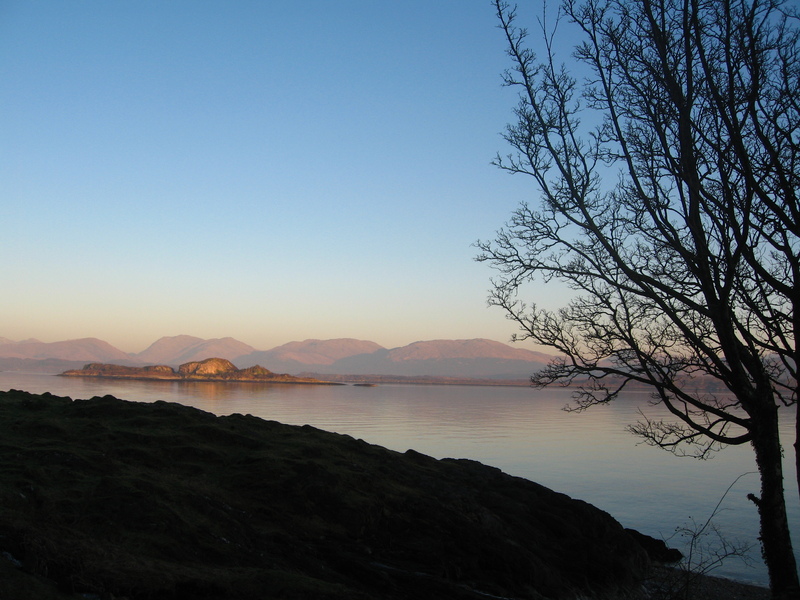 Therefore, I have chosen to change my background image, to one of the Island of Lismore, Scotland which was actually taken a a few years ago when I spent a number of weeks there in my father’s home early that year. No matter where we are on the planet, time moves forward and we should choose carefully those precious images and memories which we want to take with us.